International Market Centers officials described the Summer Las Vegas Market July 31-Aug. 4 as “epic,” with buyers present from all 50 states and an 8% increase in attendance compared with the 2015 summer show. The largest number of U.S. buyers were from Arizona, California, Nevada, Texas and Utah. International participation continued to be strong, with 73 countries represented. Most attendees from outside the United States were from Canada, China, Japan, Mexico and Panama. Traffic reports from bedding exhibitors were mixed; this was a show without big launches or line overhauls from the major U.S. mattress brands. In fact, companies, both large and small, told BedTimes, they were saving their “big news” for January. That said, there was a lot to see in terms of accessories and peripherals, as well as refinements to products that launched in January. Plenty of exhibitors reported brisk traffic, especially those who did their homework. Some exhibitors commented on the evolving regional emphasis of the summer show and a few mattress licensing groups acknowledged this by ceding floor space in their showrooms to western licensees. From a style standpoint, mattress makers continued their love affair with shades of gray on the border, paired with white or cream knit panels above. In several redesigned groups, we spotted a little more shimmer and shine in some of those gray textiles and mattress tapes, as well touches of soft accent colors in purple, pink and aqua. With younger consumers more likely to live in small spaces, more suppliers displayed easy to ship and assemble, platform-style decorative beds, adjustable beds and metal bed frames with under-bed storage and drawers. News in motion bases was impossible to miss. Makers offered updates and additions to existing lineups, including bases in new configurations with different articulation, and those that fit right onto an existing foundation or platform base. W. Silver finalized and launched an entire adjustable bed collection that it manufactures in Mexico. Customatic Adjustable Bedz introduced several new models, including one that moves you from prone to on your feet with the press of a button. Slick boxes are “a thing” in the mattress industry and apply to sleep accessories, too. For instance, Fashion Bed Group by Leggett & Platt rolled out attractive, descriptive boxing for its pillows and linens. Forever Foundations created appealing packaging for its line of under-bed accessories that rolled out in January; Hollywood Bed Frame Co. designed a trim, handle-carry box for its E3 premium bed frame; and Simmons’ nifty design for the Sleeptracker by Beautyrest box is worthy of shelf space at the Apple Store. The “quantified-self” movement is spreading in bedding—from Kingsdown’s Sleep Smart and Select Comfort’s SleepIQ technologies, to new Sleeptracker by Beautyrest, to Responsive Surface Technology LLC’s self-adjusting ReST bed, to a new Reverie smartphone app for preprograming your adjustable base. Restonic got in on the action by offering a Black Friday special with a wearable fitness tracker. Mining your personal data to improve your sleep and your life is growing by leaps and bounds and will continue to do so, as software gets more sophisticated and the body of collected data expands. This is just the beginning, suppliers promise. Pillow makers such as Blu Sleep, Malouf and PureCare mixed things up with new combinations of foams, fiberfill and new pillowcase fabrics. There were multipart pillows with zoning, insets, two-sided comfort, and more. Not only must foam mattresses and pillows sleep “cool,” they are often described as “cold,” “icy,” or “chill.” As evidenced at this show, the polar cold extends to bed linens and pillow covers as well. Brrr! Serta, part of Serta Simmons Bedding LLC, with headquarters in Hoffman Estates, Illinois, was focused on new marketing efforts. “We are continuing to drive the momentum behind Serta iComfort with an exciting campaign called ComfortSutra; it’s a provocative content marketing series designed to amplify the mattress shopping message during the upcoming Labor Day marketing window,” said Kelly Ellis, senior director of integrated marketing. The campaign began with a ComfortSutra Selfie Contest where consumers were invited to visit a Serta retailer, take a selfie on a Serta mattress and share it on Facebook, Twitter or Instagram with the hash tag #SertaComfortSutra. Serta also highlighted its iComfort Hybrid pillows, with components that mirror its mattresses. Kristi Morris, director of product licensing (pictured), explained updates to the collection that launched in January, including a longer zipper, making the pillow cover easier to remove and wash. Available in plush and firm feels, two pillows retail for $99, and a third model with Serta’s Smart Support Memory Coils at the center sells for $149. Using a machine dubbed the Tala-meter (pictured), Hinman placed a square of Talalay latex into the side of the machine and the unimpeded airflow from a fan allowed a Ping-Pong ball to float in a tube above. Other foams caused the ball to lose air and fall. “We use three words to describe our Talalay latex: ‘lift, relax and relieve’—it’s magical,” Hinman added. The company also introduced its new marketing campaign which uses the tag lines “Purely the Best” and “Purely American,” emphasizing that the company is the only American-based producer of Talalay latex. 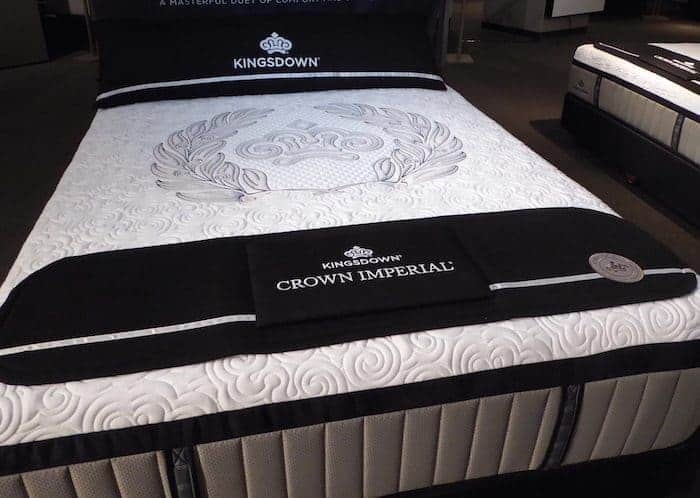 At Kingsdown, which has headquarters in Mebane, North Carolina, the luxurious Crown Imperial mattress collection took center stage. The six-model hybrid line, which had a soft launch at the Spring High Point Market, retails from $1,999 to $3,999, and features European-designed microcoils over zoned, wrapped coils. The spring unit is topped with cooling gel-infused memory foam and other high-end fills. The tufted silk and wool knit panel features a large, embroidered crest—the Kingsdown crown surrounded by a wreath—on the center of the bed. The plush mattresses range from 13 inches to 16.5-inches in height. St. Louis-based Boyd Specialty Sleep created a new kind of hybrid mattress, adding water to the top layer of a foam bed. The Izone mattress has a series of adjustable, water-filled bladders called “calibrators.” They lie within the bed’s channeled foam and are topped with a layer of visco-elastic. Consumers answer nine questions at Izonebed.com to help them calculate the correct water-fill level. Four models retail from $2,499 to $3,499. Boyd also debuted “cool” Izone pillows containing gel memory foam, gel fiberfill and two gel-filled tubes—these can be removed and chilled in the refrigerator. Retailing for $99, the pillows also have a cool-to-the- touch pillowcase. Sleep accessories supplier HomTex Inc., based in Vinemont, Alabama, expanded the DreamFit brand to include smooth-as-silk Degree 6 sheets. They have a subtle window-pane design motif and are woven with 70% Micro Tencel yarn and 30% U.S.-grown, long-fiber Supima cotton. Available in ivory, white or tan, a queen set retails for $199.99. New top-of-the-line Degree 7 sheets (pictured) are 100% American Supima cotton, cut and sewn in the United States, and come in antique white, cocoa or mocha. The flat sheet has an embroidered hem with an elegant “triple baratta stitch.” Queen Degree 7 sheet sets retail for $249.99. The linens boast 600-thread-count, single-ply American cotton for “cool, crisp durability,” said Benjamin Nelson, director of sales and development. DreamFit sheet sets include a “luxury-sized”, extra-large flat sheet, a patented fitted sheet that is “Guaranteed To Fit, Guaranteed To Stay On” and two pillow cases. The DreamFit lineup is classified into seven levels—Degree 1 through Degree 7. “It’s a great story for consumers—not confusing—and each level carries the DreamFit advantages,” Nelson added. Mattress producer Blu Sleep Products, pulled in new accounts because summer buyers are “shopping with a purpose,” said Elizabeth Dell’Accio, vice president and company principal (pictured with pillow display), of the Laval, Quebec- and Pompano Beach, Florida-based company. Blu Sleep introduced a more affordable mattress in its Nubia collection; this one uses the company’s signature Italian foams with bio-based content, and offers soft, medium or firm support. The bed retails for $2,199 and has a contoured memory foam combined with a zoned, high-resilience and channeled base foam. The company also designed a unique new cover for all of its pillows with spacer fabric on one side and a soft Tencel knit on the other. In addition, there were six new pillows, retailing for $149; they included the Bi-Touch dual comfort pillow which uses two foams, one on each side, for a choice of comforts. Adjustable base supplier Ergomotion Inc., with headquarters in Santa Barbara, California, a subsidiary of Jiaxing Shufude Electric Bed Co. Ltd., based in Jiaxing City, China, turned its attention to the needs of smaller retailers with a good-better-best line of branded bases. The basic head-up ErgoPure model has headboard brackets, a built-in USB charging port and interchangeable choice of leg heights. Ergo Classic offers head and foot adjustability and a wireless remote that enables you to preset and save your favorite position. The top ErgoElite base (pictured) adds head tilt, lumbar control, a wireless remote with multiple presets, massage, Bluetooth capability and under-bed lighting. The model has the look of a contemporary wooden platform base. Mattress manufacturer Symbol Mattress, with headquarters in Richmond, Virginia, launched SleepFresh, a three-bed collection that uses the Richmond, Virginia-based company’s exclusive Climate Control Sleep System. Priced from $1,799 to $3,999, SleepFresh offers heating, cooling and ventilation technology developed with Northville, Michigan-based Gentherm. The top model offers the broadest temperature-adjustment range. The mattresses are available in three heights, from 9 inches to 11 inches, with three distinct feels. They contain dual climate control units located within the steel foundation. The all-foam beds incorporate layers of high-end visco-elastic, polyurethane and latex foams that incorporate gel, phase-change material and other technologies. Beds are covered in unquilted stretch knits said to be moisture-wicking, breathable and with an athletic-wear look. Mattress licensing group Eclipse International/Eastman House, part of North Brunswick, New Jersey-based Bedding Industries of America, returned to the Las Vegas Market and announced it signed a long-term lease for a prominent, spacious showroom on the 11th floor of Building B. Inside, there was ample room to display the group’s newest products, including the Eastman House 150th Anniversary line, in both color variations, as well as two western licensees’ unique offerings. At Fashion Bed Group, a division of Carthage, Missouri-based Leggett & Platt, there was a special focus on platform-style beds with under-bed storage. In all, there were 10 new models, including the Delaney platform bed upholstered in white faux leather and offering two discreet drawers at the foot. Available in queen, king and California king, it retails for $699 and features a headboard with vertical piping for a contemporary look. At the same price point, the Mission-style Hampton bed also offers under-bed storage at the foot and comes in a gray, wood finish. FBG also announced the “formal launch” of its SleepSense packaging and merchandising program for all sleep accessories. Product collections were renamed according to primary benefits—Sleep Calm, Sleep Chill, Sleep Plush—and the descriptive packaging is color-coded in soft shades of silver, blue and rose gold. Mattress licensing group King Koil displayed new looks in King Koil World Edition, an affordable innerspring line that retails from $499 to $999, as well as a new, higher-end World Luxury Intimate collection. The three-bed group from the Willowbrook, Illinois-based company has specialty foams, coil-on-coil technology and a Perfect Contour Reaction Coil core. The bed uses a zoned arrangement of coils with different diameters to improve spinal alignment. A firm and a plush model retail for $1,999 and the euro-top version is $2,499. The new Laura Ashley Rose collection (pictured) stole the show; it occupied a prominent spot in the showroom with gray and pink accents and point-of-sale accessories that were both feminine and on-trend. Five beds, priced from $1,199 to $1,999. Beautyrest / Simmons Bedding Co. The focus at mattress major Simmons Bedding Co., part of Atlanta-based Serta Simmons Bedding LLC, was Sleeptracker by Beautyrest. The standalone device has small and extremely precise sensors that slip under the mattress and are capable of capturing heart rate and movement. A dual-sleeper model retails for $299; the single version is $199. With the tag line, “Make Every Bed a Smart Bed,” the units have slick, colorful packaging, and are being marketed to bedding retailers, as well consumer electronics stores. JD Velilla, Simmons director of electro-mechanical design, [pictured, with point-of-sale Sleeptracker smartphone display and Sleeptracker display case (far right)] explained how the unit allows users to monitor and minutely assess their sleep patterns, when they download the Sleeptracker app to a smartphone. Sleeptracker was developed with technology company Fullpower. Simmons also made a market splash with an enormous mural on Building A celebrating its “Dream in Black” advertising campaign for Beautyrest starring NFL quarterback Tom Brady. Michelle Montgomery, vice president of marketing communications credited the campaign with increasing sales by 12%, compared with one year ago, and delivering a sizeable jump in average unit selling prices. Durability and luxury were the focus at Englander Sleep Products. Its new ultra-premium Forever line is two beds, in firm and soft comforts, with high coil counts and fabrics containing Tencel yarns. “We call it Forever because it will not lose its firmness,” said Kevin Toman, president and chief executive officer of the Chicago-based mattress licensing group. The 14.5-inch soft version features more than 6,000 pocket springs and a comfort layer of Omalon foam. The 15-inch firm model offers a dense foam encasement, more than 5,100 wrapped coils and uses Omalon foam as a support layer. The top contains a slow-recovery latex layer. The beds are paired with a premium deck-on-deck adjustable base and retail for about $5,999. Pillow and protector supplier ViscoSoft got into mattresses with the introduction of a 12-inch memory-foam bed in three comforts, specifically designed for pairing with adjustable bases. With an expected retail price of about $1,299 (mattress only), the beds use the same gel-infused foam and proprietary Cold Wire Plus technology as the company’s pillows, “to take the cooling story all the way through from the fabric to the foams,” said Harry Constantino, the Asheville, North Carolina-based company’s director of training and account development. Mattress licensing group Spring Air International added three models to the successful 90th Anniversary bed collection. “All of our factories make this collection and it’s one of the reasons we’ve had back-to-back record quarters this year,” said Rick Robinson president of the Boston-based company. The beds feature a zoned, wrapped-coil core topped with high-end foams. Models at the upper end have coil-on-coil construction. Three new models offer a choice of firm or plush feels and bring the group new opening price points of $599 in a tight-top and $699 in a euro-top. The Anniversary collection tops out at $999. Fabrics and top-of-bed items continue the collection’s “formal wear” looks in black, silver and white. Spring Air also expanded the newest Chattam & Wells line (pictured, with Nick Bates, vice president of sales), adding “latex hybrid” models that use Talalay latex, Joma wool, and coir fiber blended with latex over the group’s wrapped-coil core. Chattam & Wells retails from $1,999 to $3,999, and the new latex versions were designed and built by licensee, Spring Air-California/Pleasant Mattress. Bed frame manufacturer W. Silver Products, with headquarters and manufacturing in El Paso, Texas, and a second manufacturing plant in Juarez, Mexico, held a major launch in Las Vegas. The company designed and produced its first adjustable base collection, Comfort-n-Motion by W. Silver Products, a group of four upholstered bases, available in mocha or graphite and priced from $799 to $1,499. The motion bases are equipped with a range of basic-to-deluxe features, which the company fully explains at a new product web page, http://comfort-n-motion.com/products/. The opening price-point Silver Series has full adjustability and a wired remote. The three models in the Gold Series (pictured) offer a deck-on-deck design and a number of luxury features. The GS70 bed has greater articulation, including a lounger and TV-viewing settings; pulse, variable and wave massage; recessed wood legs; under-bed lighting; and other premium features. Designed by W. Silver and manufactured at its Juarez plant, the bases are sold via wholesale channels, only; use FR-inherent upholstery fabric; and are available in-stock and with a small minimum order, said Brent Polunsky, sales manager. Mattress licensing group Therapedic International, which has headquarters in Princeton, New Jersey, introduced the musically inspired Bravura specialty sleep collection. Priced from $1,499 to $3,999, four mattress models are 10 inches to 13 inches in height and combine top comfort layers of either copper-flecked memory foam or latex foam, over high-density cores of polyurethane foam or latex. Each model is named for a classic rock album and the precision-sewn covers sport labels and foot protectors embellished with a piano-keyboard design motif. Expect to see an expansion of the collection in January, the company said. Also new at Therapedic was a two-sided group called Innergy 2, retailing from $799 to $999. Three beds, from 13 inches to 15 inches in height, have an LFK innerspring unit with a mix of high end foams in the comfort layers. The mattress has a charcoal border with vertical handles and a white knit panel. Aireloom / E.S. Kluft & Co.
E.S. Kluft & Co., manufacturer of the Kluft and Aireloom mattress brands, introduced a new look for the Aireloom Aspire collection. “It’s is a little more dramatic and, in the step-up, we use our microcoil technology,” said David Binke, chief executive officer of the Rancho Cucamonga, California-based company. New fabrics include a plush gray knit border with a geometric, quilted effect. It’s embellished with an Aireloom-branded ribbon (pictured). Support layers for the La Brea model include wrapped coils topped with Aireluxe plush foam and slow-recovery viscoelastic foam. The Pasadena model is coil-on-coil layered with slow-recovery viscoelastic foam imbued with phase-change material. Beds are priced from $2,000 to $2,799. In addition, Kluft partnered with Reverie to introduce the 8 Series adjustable foundation, a high-end, upholstered, deck-on-deck base that is paired with Aireloom mattresses. Commerce, California-based Hollywood Bed Frame Co. showed off the new handle-carry, smaller packaging for its E3 premium metal bed frame. “This is a one-size-fits-all, cash-and-carry frame and we just got the patent (for its hinging mechanism),” said Jon Mullinax, vice president of sales and marketing, shown here demonstrating how the box fits into a shipping company package-drop box. The strong, hinged frame is priced to retail at about $129; it assembles quickly and easily without tools, nuts or bolts, and has a center support and nine legs. Among the launches at sleep products supplier Malouf was the Gel Talalay Latex pillow, with a retail price of $159.99 in queen. The latex pillow is gel-infused and has zoned pin-hole coring to provide different support for the head and neck. Unlike other foam and latex pillows, this one is “super ‘scrunch-able’ and best for side sleepers,” said Jake Neeley, marketing manager for the Nibley, Utah-based company. The zip-off, knit pillowcase is a washable velour fabric from bamboo viscose and polyester yarns. Malouf also added the Isolus Fiberbed, a 3-inch tall mattress topper filled with down-alternative polyester fiber, covered with a woven cotton cover and retailing for $209.99 in queen. “You can make your memory-foam bed into a pillow-top mattress; (the topper) creates an air layer to help you sleep cooler,” Neeley said. St. Louis-based Glideaway re-engineered its affordable Freestyle adjustable base, which is designed to work with an existing foundation or platform base. The slatted Freestyle has enhanced support features and is a good choice for e-commerce due to its lighter weight and compact packaging. The company uses the trademarked “Comfort Base” moniker to describe its entire collection of adjustable bases, said Daniel Baker, executive vice president of lifestyle products. But, Glideaway also promotes the health benefits of adjustable foundations, which can help improve circulation, alleviate sleep apnea and reduce acid reflux. The Freestyle retails for $799 to $999 to $1,499. Atlanta-based Responsive Surface Technology LLC featured the ReST Bed at its second Las Vegas appearance. The five-chamber airbed uses a semi-conductive fabric devised by the company’s executive chairman Rob Golden, an engineer who holds more than 20 U.S. and international patents. A thin sensor-embedded fabric is sewn into the bed’s panel fabric, turning the airbed into a smart bed. Proprietary software, the ReSTdash app, monitors a sleeper’s body and movements in real time and manages mattress comfort by making pressure-relieving adjustments to the airbed throughout the night. “The cutting-edge (ReST Bed) gives each sleeper a custom fit and provides sleep data so you have the information you need to perform at your best,” said Bryant Looper, senior vice president of sales. (Looper is pictured on the ReST Bed, with swatches of the sensor fabric at the foot and holding the Samsung tablet with preloaded “ReSTdash” app, which comes with every bed.) A single model retails for $6,499. Inside, there are layers of proprietary foams including Cool Bounce Copper Gel memory foam. The 11.5-inch mattresses retail for about $899 and are compressed and packaged in royal blue boxes that can be floored in-store, or Diamond will drop-ship the beds directly to consumers. Mattress licensing group Restonic, with headquarters in Buffalo, New York, featured its annual Black Friday special purchase. This year it was a Restonic ComfortCare model in graphic black and white ticking with a host of signature features from gel-infused memory foam to Marvelous Middle lumbar support. The innerspring bed retails for about $899 and comes with a free, multifunctional fitness tracker bracelet that syncs to any smart device. The company also redesigned the box for its Brio by Restonic boxed-bed program for retailers, said Julia Rosien, Restonic Brand Director. As part of a Brio giveaway and promotion, Restonic received more than 1,000 entries in a Facebook contest asking entrants to share their reason for needing a new bed, she added. Fairfield, New Jersey-based PureCare added to its pillow and sheets collections. Part of its Elements bed linens, the new Arbor line uses Lenzing’s Modal yarns, a viscose made from sustainably forested beech wood. The $149 sheet set has precision-fit corners and comes in white, ivory, dove gray and light blue. Three new pillows in the Sub-0 line include Down Complete, which retails for $89, and has white down in a central chamber, and the “Gel-Egant” and Replenish pillows, which retail for $99, and have cooling gel over memory foam. Pillowcases have a cool feel thanks to the company’s proprietary Frio fabric. Natick, Massachusetts-based Customatic Adjustable Bedz launched a number of new adjustable bases. The Hideaway (pictured), available in queen and twin XL, lifts to provide hidden storage at the foot. The head-up adjustable base with foam mattress is expected to retail for $1,199. The Independence base makes it possible for seniors to go from a flat sleeping position, to an upright sitting position, to standing up. With the push of a button, the bed swings sideways into a chair, and then into an assisted chair lift. Available in twin XL, it retails for about $1,699. The SwingFlex is a one-piece, king adjustable base that, with a folding clamshell design, ships in a single box. The Dual SwingFlex allows for independent adjustability on either side. The bases retail for $799 to $999. Steel base and accessories supplier Forever Foundations introduced the Store More Black foundation, retailing for $399 in queen and replacing the more expensive Max base. The new foundation, which ships in a U.P.S.-friendly box, has 13 slats and simply clicks together, without tools or fasteners. The company, which has headquarters in Irvine, California, also featured its line of under-bed accessories, adding attractive, new boxed packaging and new items, such as metal mesh drawers and a new power strip with hooks that attaches to any bed frame ($69.99). Sleep products supplier Reverie, headquartered in Bloomfield Hills, Michigan, focused on its DreamCell mattress collection, expanding the Dream line with four “hybrid” beds that use memory foam or latex in the comfort layers. The six-bed Dream collection offers customizable comfort and retails from $1,499 to $3,499. Also new were Dream Top split king or California king mattresses for adjustable bases. They retail from $4,499 to $5,499. The free Reverie Nightstand app allows consumers to preprogram their Reverie adjustable base to fit morning and evening routines. For instance, it can elevate the head from 9:30 p.m. to 10:30 p.m. for reading, then move into zero-gravity position and begin a massage before flattening out for bedtime. The app is compatible with Bluetooth-enabled Reverie bases sold after 2012.